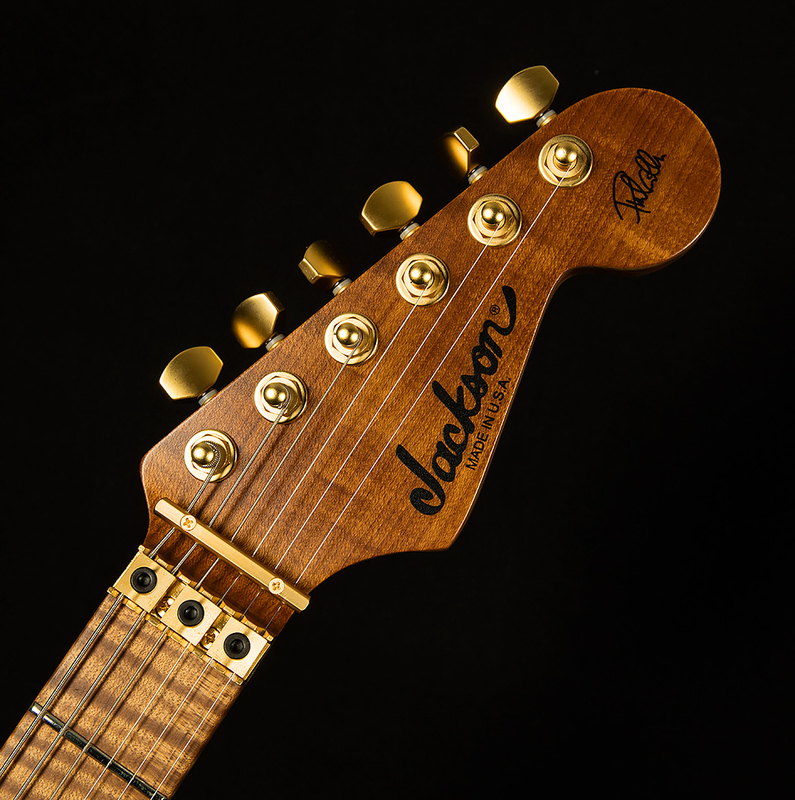 First things first: the Jackson PC-1 Phil Collen Artist Signature is a well-built piece of machinery with luxurious feel, elegant looks, and an uncommonly rich, warm sound. In fact, the stalwart Def Leppard guitarist's signature model may very well have some of the most inspiring tone out of any quote-unquote "shredder" guitars out there. 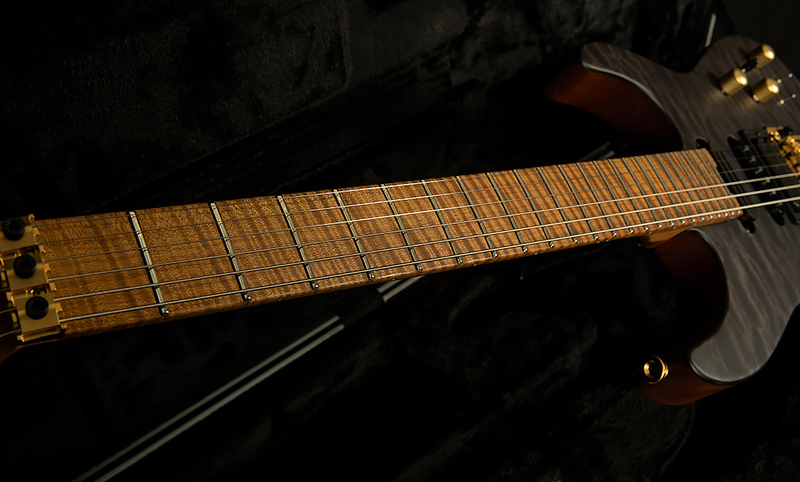 All of the wood except for the gorgeous quilted maple top has been "caramelized" through a specialized roasting process, and this livens up the guitar's harmonic response while enhancing stability. Caramelization also gives the guitar woodier, warmer tone. The not-too-thin, not-too-thick neck also has a hand-rubbed gel urethane finish, which gives the player unparalleled comfort. So, before electricity even enters the equation, the PC-1 feels great and speaks with a clear, rich, authoritative voice. When you do plug in, the Super Distortion humbucker in the bridge provides plenty of hot-rodded blistering rock tone, but the inherent warmth of the body keeps things sounding rounder than normal even when you push your amp into high-gain territory. The HS-2 in the middle position adds a whole new dimension to explore, because it also has a unique tonality. It was one of the first humbucking Strat replacement pickups, and though it does have full frequency response, it puts out a brighter, clearer tone than most humbuckers. When you split the coils, though, it gives you gorgeous old-school quack. 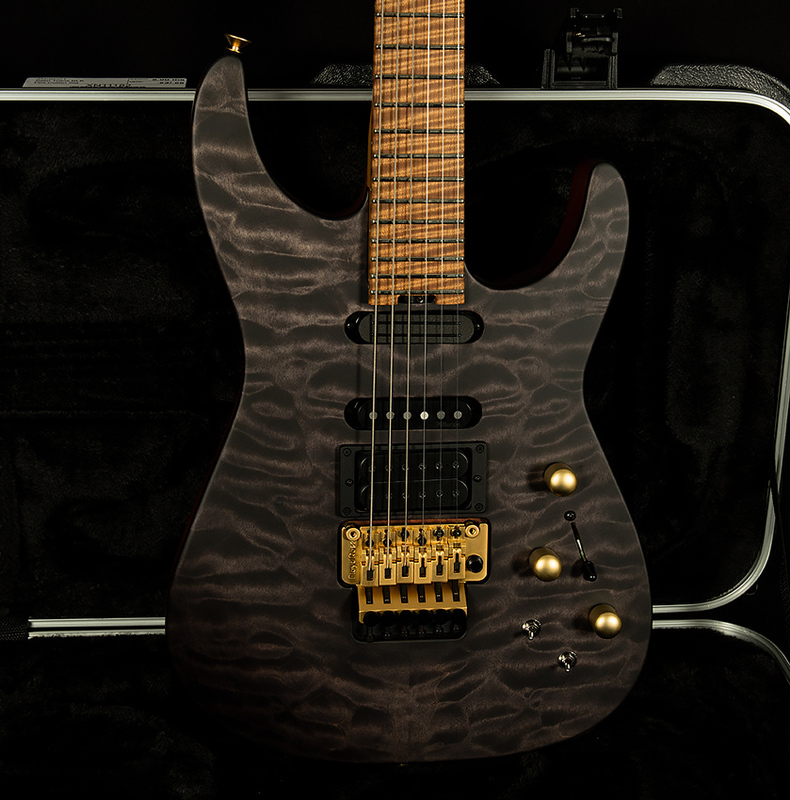 So, the pickups in this beast give you an incredible array of options, making the Jackson Phil Collen one of the most versatile Floyd Rose-equipped guitars out there! We could stop there and this guitar would already cause any self-respecting metal fan's Gear Acquisition Syndrome to flair up, but I would be remiss if I didn't also mention one important fact: THIS IS THE FUNNEST GUITAR IN THE ENTIRE WORLD TO MAKE CRAZY NOISES WITH. Now that I've got my Caps Lock abuse out of the way for the day, let's talk about the PC-1 Sustainer Driver pickup in the neck position and its propensity for prompting spontaneous outbursts of pure six-string joy. The PC-1 Sustainer Driver is a ridiculously cool creative tool. When you engage the Sustainer Driver with the mini-toggle switch, you get endless sustain that blooms behind whatever note you're playing (you can easily turn it into feedback if you're playing with lots of gain, too!). The other mini-toggle allows you to select whether you want the whole note to sustain, or just the harmonics. In the "whole-note" mode, the Sustainer Driver gives you a glorious angry 400-pound cello sort of sound. In harmonic mode, it sounds like an angry church bell! When you pair these inspiring sounds with the pitch-bending capabilities of the Floyd Rose, the possibilities for Eddie Van Halen-style pyrotechnics are endless. Turn the sustainer on harmonic mode and hit all the 12th fret harmonics, then go nuts with the vibrato, and you'll be smiling like a little kid. At the end of the day, we guitar players just love to make loud noises, and the Phil Collen Artist Signature lets you indulge your primal impulse to be LOUD! Of course, the Sustainer Driver pickup isn't just a tool for hair-metal mayhem and tomfoolery. Personally, I love shoegaze music like My Bloody Valentine, and I could see myself using it to create pretty walls of delay- and reverb-laden noise all day long ("MOOOOOOOM, I AM NOT MAKING NOISE! I AM CRAFTING SOUNDSCAPES!"). Frankly, anyone who uses the word "post" with a hyphen after to describe the kind of music they play could probably have a field day with this guitar (especially post-metal dudes!). So, there you have it. Who'd have though the guitarist from Def Leppard's signature Jackson would have such universal appeal? It makes sense, though: every guitar player just wants to make a joyous noise and look good doing it, and this guitar gives you the tools to do so and then some. Even without the Sustainer, it would be an unstoppable shred machine. With the power of the PC-1 pickup, this guitar has the power to create utter sonic hysteria. 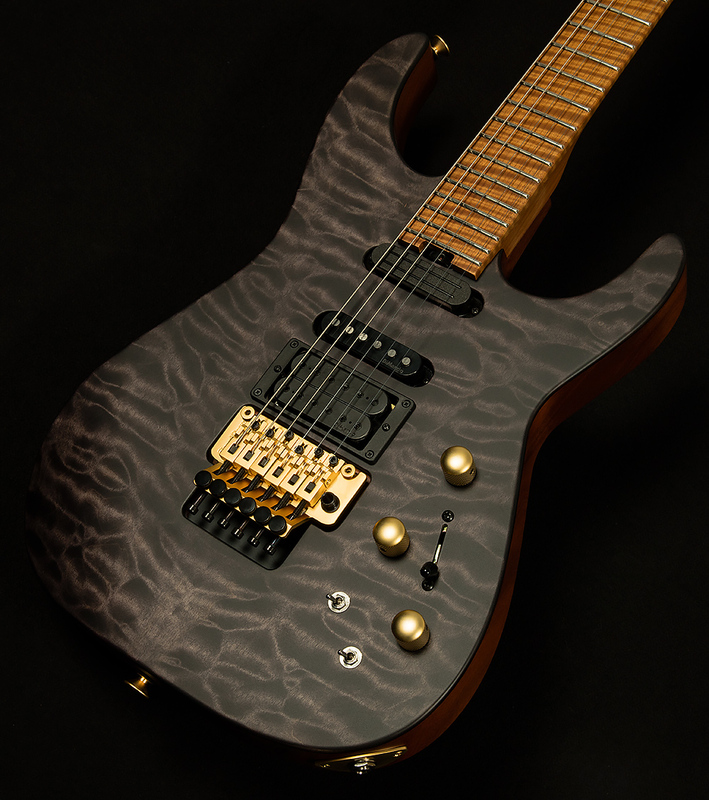 The Wildwood team invites you to experience the pure delight of the Phil Collen Artist Signature. No need to pour any sugar on it--this thing is already sah-weet!